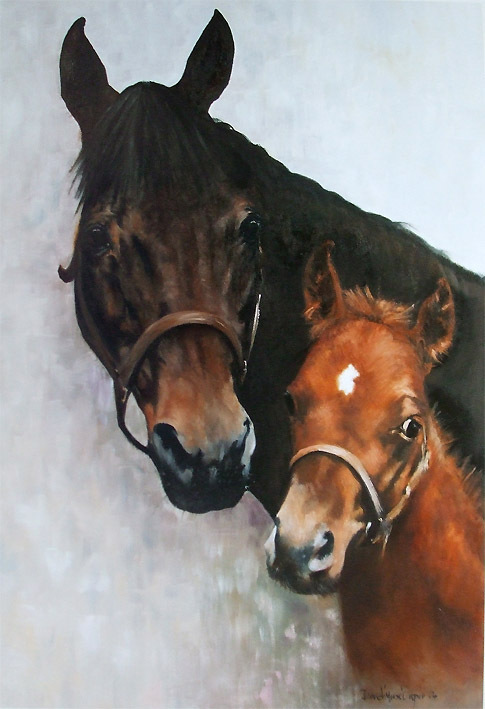 Born in London David “Mouse” Cooper has combined his love of horses with his talent for painting since an early age. During his career in racing "Mouse" as he had become known had a spell in the saddle, and then went on to work for H. Thompson Jones (Trainer of Tingle Creek), Mark Tompkins and various other Newmarket trainers. During which time he painted mainly commissions of stable favourites and classic horses in order to help develop his talent. “Mouse” graduated with a BA honours at APU, Cambridge in fine art and illustration, where he tailored his degree to help further his passion for equine art. “Mouse” had the great honour of having one of his paintings of The Pre Parade Ring at Newmarket, showcased on the racecard cover of the Rowley Mile Course, Newmarket for the 2005 flat racing season.